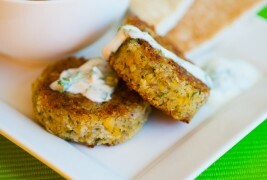 These mini chickpea burgers – a combination of grain and bean – are my version of falafels that are not fried. With a simple, creamy yogurt sauce and pita triangles, they made a great side for a soup. One of our frequent outdoor vacation destinations is Bethel, Maine, home of Sunday River Ski Resort and one of our favorite eating spots: Café DiCocoa. The vegetarian café’s ever-changing breakfast and lunch menu can include fresh peach scones, homemade bagels, vegetable frittatas, soups and a variety of salads, all made with fresh ingredients by a very creative chef/owner, Cathi DiCocco. 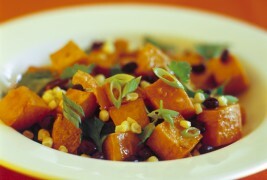 One café favorite is this combo of roasted sweet potatoes, corn and black beans with a uniquely delicious chipotle-sweet chile sauce dressing. You can also find the recipe in Raising the Salad Bar, and in the few years since the book came out, many people have told me how much they love the flavors in this dish.